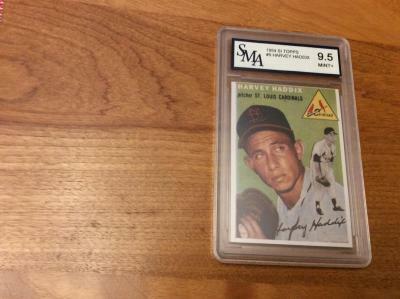 Duke Snider, Harvey Haddix, and a number of other possibly valuable cards. After a bit of research I realized that PSA is the "gold standard"
of rating services. Unfortunately the cards we possess were rated by SMA (currently defunct). They appear to be encapsulated in a permanent plastic sleeve. (see picture). Any advice anyone may have on how to maximize profits for our charity would be appreciated.